Adam Hegsted (front) as his Wandering Table staff, many of whom are his longtime friends and co-workers. The servers sit at the bar with pens and copies of the menu, intently taking notes. They've been guided through the menu of craft cocktails, sampling a few drops of each one with tiny straws — everyone agrees the mint-garnished Balboa will be a hit — and now it's time for a quiz on the extensive food menu: What is "edible dirt"? What are sweetbreads? What is bacon wrapped bacon"? In just a few hours, diners will start arriving for the soft opening. In the back, pans clatter as the kitchen staff gets ready. Out front on the sidewalk, a man screws a metal sign with the restaurant's name into the sand-colored wall: The Wandering Table. Those who've followed chef Adam Hegsted's career in the Inland Northwest will recognize the name from the pop-up restaurant he created on the side while serving as executive chef at Coeur d'Alene Casino. In that version, the Wandering Table appeared in various locations as a sort of intimate supper club of strangers, where Hegsted served a 12-course meal inspired by the seasons. With a permanent home, the roving is over and the doors are open to all. Hegsted hopes the restaurant's tapas-style menu of small plates will similarly let diners experience a variety of flavors and venture a bit outside their comfort zone. "People are going to be able to order two plates or three plates to share," Hegsted says, "and maybe two of those things are safe things, and the last one is something that you usually wouldn't order." At 34, with a boyish grin that often sneaks across his face, Hegsted already has a long list of honors and successes for a Spokane kid who got his start washing dishes at Marie Callender's in the Valley. He went to culinary school in Spokane and at the Art Institute of Seattle, became executive chef at Cedars in Coeur d'Alene, made a name for himself at Brix and the short-lived Le Piastre, reworked the dining experience at Coeur d'Alene Casino and in 2012 was invited to serve dinner at the James Beard House in New York. Through this, he's honed a philosophy of regional, seasonal food that cleverly challenges diners' expectations. At the Yards Bruncheon, Hegsted's other restaurant that opened this year in Kendall Yards directly next door to the Wandering Table, that philosophy is applied to a classic diner. At Eat Good in Liberty Lake, it's applied to cafeteria-style lunch. But the Wandering Table is a work of passion, where the vision is revealed most clearly and the stakes are highest. "It's scary," he says. "I had a really comfortable job at the casino where I was paid well and had benefits and all these things. To take the leap to my own place is a big leap, but it's a different thing ... When you have a chef-owned restaurant, it's different from when somebody else is owning it, because I'm willing to take a little more risk than most people." Among those who heard about the Wandering Table in its traveling version was Kendall Yards CEO Jim Frank, who attended several of the dinners and later helped Hegsted secure the spot among Kendall Yards' carefully selected restaurants. Making it happen is something of a family business, with Hegsted's brother, Ryan Stoy, in charge of the day-to-day kitchen operations as chef de cuisine. (Their youngest brother, Alex, is in culinary school.) And the other key members of the staff are like family anyway, Hegsted says, because they've been working together so long. 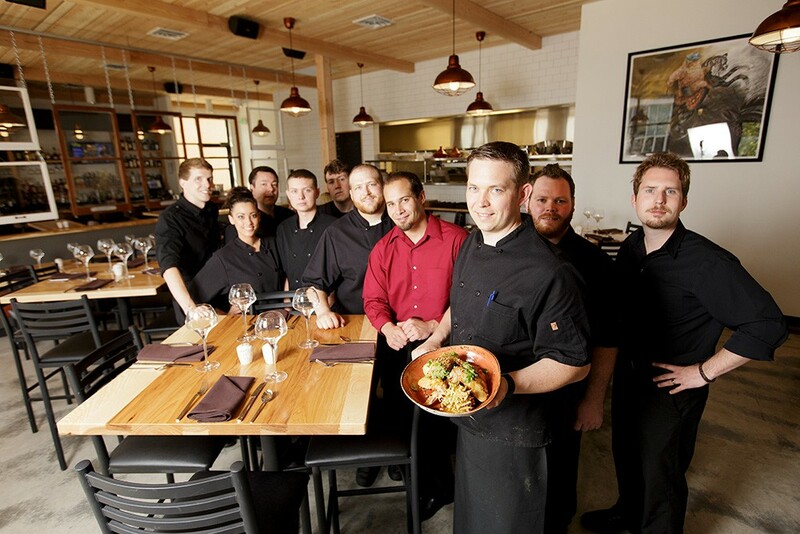 Manager Paul D'Orazi started working with Hegsted at Brix 10 years ago this summer. The pair are friends whose families spend time together outside of work. D'Orazi says they hire people who make good members of the team, even if it means more training, and that Hegsted — the temperamental opposite of the expletive-screaming chefs seen on TV — creates a family-like atmosphere among the staff. "The people who work for him respect him," he says. "I've seen him get mad, a few times, but it's never the Gordon Ramsay reaction. I think he brings a calming demeanor to the kitchen, which in turn can lead to a calmer demeanor in the front of the house." In a broad sense, the experience of dining at the Wandering Table is not unlike going to a winery or brewery to sample their full range of offerings. Why commit to a single glass when you can taste a little of everything? And why not bring a few friends to compare thoughts and reactions? Most dishes on the menu could easily make a meal for one, but guests are encouraged to share. It's a liberating notion for those who are always trying to sneak a bite from other plates at the table. The seasonally changing menu includes traditional dishes with a modern twist, such as spaghetti stuffed meatballs ($8) and calamari Alfredo ($11). Or the bacon wrapped bacon sliders ($7), which — as your server could tell you — is pork belly served with crispy bacon. The restaurant's ambience reflects the menu's mix of modern and traditional, with brass-colored fixtures and salvaged windowpanes hung between the bar and the main dining area. Unfinished wood beams line the ceiling, and the names of local farmers and suppliers are listed on a chalkboard on the wall. The warmth is extended to the whiskey-focused bar, which offers a selection of strong cocktails ($6-$8) and wine by the glass and bottle. Also offered is a novel chef's tasting menu option, where guests name the amount they want to spend per diner ($15-$65), and a customized menu is created on the spot, in a way that harkens back to the surprise element of the original Wandering Table.